Yes to healthy black hair! 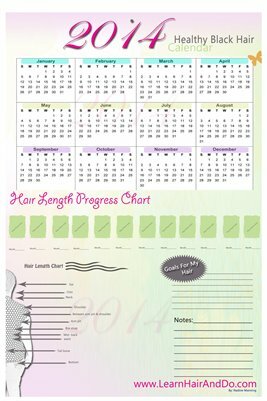 This calendar is great for ladies who are just starting on their healthy hair journey. It includes a the 12 months of the year, hair length progress chart, and hair length diagram. Also a place where you can jot down the goals that you have for your hair and a place to write down notes. Place this unique calendar on your fridge, on the wall next to your mirror or anywhere that you can easily see it. grab yours today!